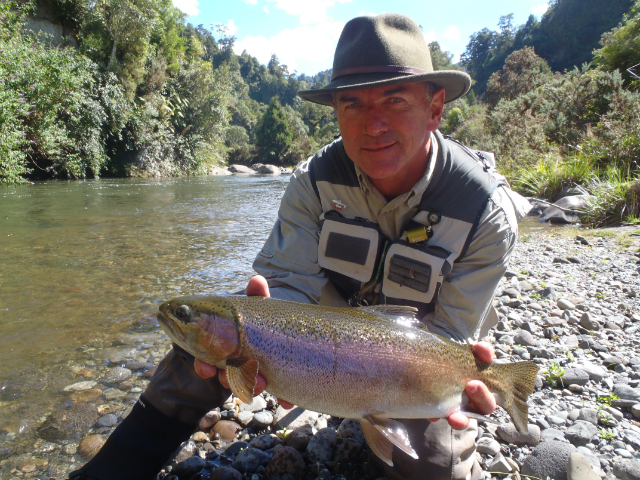 Welcome to another year of fishing and exploring the great outdoors of New Zealand. The website I hope will be updated regually with fishing reports but as you may appreciate we are currently very busy taking clients to some special places most days, the busy season will continue for a couple of months yet. This busy problem is a good one to have and we thank you for all the new custom this year and of course our regular clients which really are the backbone of our business. Hopefully this coming winter season will be one to remember and some of you summer fisherman will let me convert you to a true winter angler. 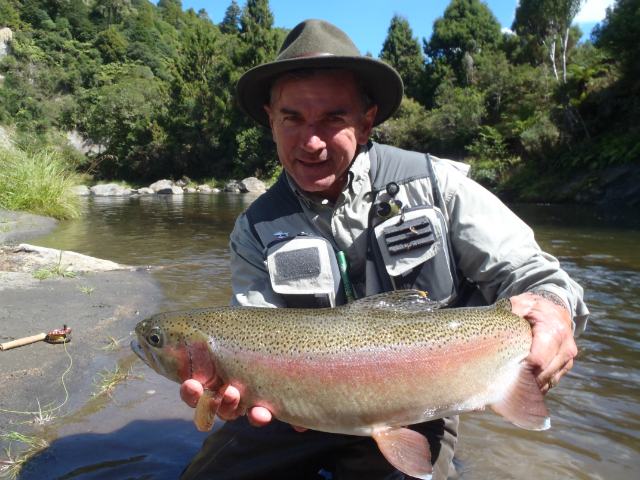 Fishing has been pretty good in most places lately especially with a good weather pattern we have enjoyed here in the central plateau. 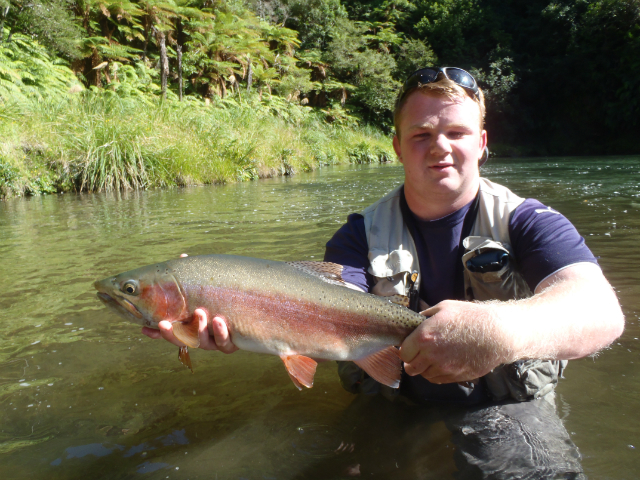 Lake Taupo has fished very well with all boat anglers finding a fish using most methods from trolling to jigging to throwing the smelt patterns around in the western bays. The condition of fish are very good and we are hearing no complaints from most fisherman and even the local newspaper seems to be reporting good things for a change. The winter fishing is shaping up to be a beauty with all these good fish expected in the rivers for spawning over winter months. Local rivers over summer have been very hit and miss for me and my clients . We are catching fish on most trips but some are very tired and skinny or very small being juvenile fish. Rivers are and have been very low and clear for a long time now and a good layer of summer slime can be found in most rivers and on every rock.Water temperature in rivers is quite high leaving most fish finning in fast riffles sucking the oxygen which is left in the river. The brown trout so far have been disappointing compared to other seasons but I have seen the odd one turning up lately and have some good reports of the lower Tongariro having some good numbers so we should see aÂ few more of these in the upper reaches very soon. Dry fly in the evenings still seem to excite anglers on most rivers and total die hard dry fly fisherman have been getting some action on the calmer nicer days using cicada’s in the upper river-again fish the shallow fast water this is where fish will hang out in hot conditions. Backcountry……..well where do I begin. With the nice weather we have had this has pushed fish to the surface causing them to munch onÂ any floating terrestrial pattern. I have seen some exciting top water fishing over the past week and have been impressed with both size and condition of these trout. 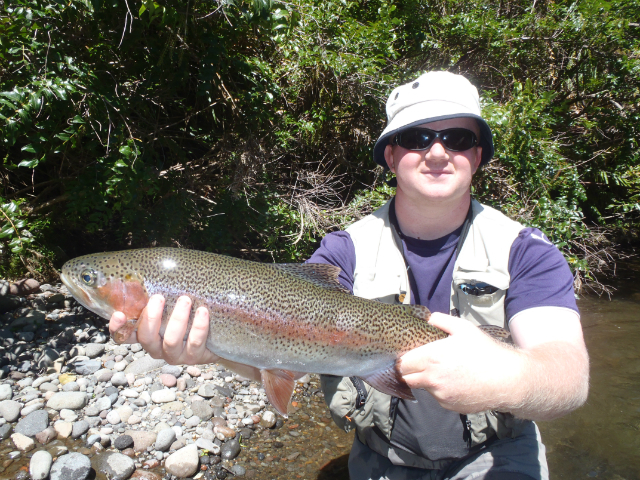 There’s nothing better than seeingÂ your fly being engulfed with teeth as the trout pounces from the opposite side of the river or your size #16 Adams getting sipped from mirror water in a Chrystal clear river. Currently we have both sight fishing and prospect fishing available and have done well in both small still water fisheries but also rough pocket water with plenty of freestone wading. Lake O has been Oarsome but stressful. The fish in this lake season have been very good and most outings have provided some great sport for most boat fisherman. Stressful because nearly every trip to this lake I have to watch dozens of beautiful big trout beingÂ killed for smoking as some anglers think they are doing the fishery a good deed?? This is not the case and it will be the same anglers crying poor in the following years when fishing becomes hard and they cant catch those 7lb fish like we can at the moment. If you are going to killaÂ fish and show your manly side to the wife while presenting her a mud fish take a the 2lb fish which may give you some goodness when eating it. Â In saying that the fishery seems to be in good order and some great sport can be had by stripping wet patterns over weed beds or nymphing the edges with small worm patterns or snail patterns. Theres a start for 2013, hope you are all getting out and enjoying some of our summer .